Only one book in my long literary history has made me cry–John Reynolds Gardiner’s Stone Fox–and it was a full-on, heart-wrenching, ugly kind of cry. (If you’re uninitiated, Stone Fox is a chapter book about a little boy in a sled dog race. If it doesn’t send you into hysterical sobs, you might want to check your pulse.) Before I Die is one of the few books that’s come close to taking me back to that place of complete emotional train wreckage. 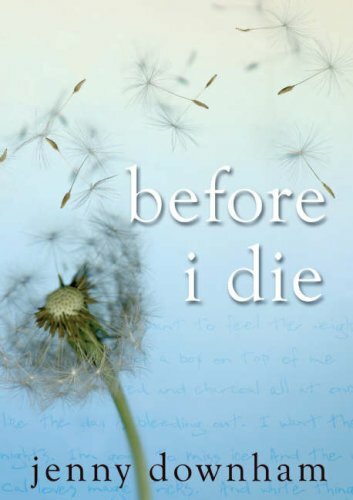 Despite its melancholy tone, Before I Die is a lovely book. The voice, supporting characters (I adore Tessa’s dad), and setting (yay British slang!) are all quite strong. But there are three things in particular that, for me, nudged this book over the REALLY GOOD line and into GREAT territory. 1 – Tessa. Yes, she can be bratty and selfish and very unlikable, but she’s dealing with A LOT (so much more than your average contemporary YA protagonist), and I think she does so realistically and with more grace than I could hope to retain if faced with a terrible illness and certain death. I enjoyed watching her interact with those around her, especially her dad and her adorable little brother, and it was fascinating to watch her fall slowly and intensely in love. 2 – Adam. Tessa describes him as ugly. She mentions that he has dirty fingernails. He’s kind of sketchy, initially, and his mom comes off as a kook. What’s to like, right? Um, a lot. Growing to know Adam through Tessa’s eyes made him utterly irresistible. Over the course of the book he became this sweet, sensitive, unbelievably strong romantic interest who I won’t soon forget. 3 – The Conclusion. In case you didn’t get this from Before I Die‘s summary, Tessa’s life is coming to a rapid end. That’s a given. They mystery behind this book, the element that kept me turning pages, was HOW she and those closest to her would deal with her death. The format chosen for the last several pages of the story is brilliant. It made me feel what Tessa and her family and friends were feeling, like a bit of me was fading away. And that’s when the tears *almost* came. Shannon Messenger delves into DOUBLE with an arc giveaway! You’ll have to let me know how you like that one, Jen. I really enjoyed her writing style. It’s one that reads effortlessly, and I found her voice to be very realistically teen, yet still mature. This one sounds good–and intense. Adding it to my TBR, but I might need to wait until after TFIOS. Yes, it’s definitely intense. And yeah… it’s a “cancer book” like TFIOS, so I understand your need for a little room between the two. Definitely not an uplifting topic. This one sounds INTENSE. I love me some good contemporary, so I’m definitely adding it to my TBR list. If you love intense contemporary, this is SO your book. Have tissues on hand if you’re a crier!